Everyone nowadays is more aware of the importance of personal information security and the dangers of domestic and business identity theft. With affordable secure shredding and data destruction from Let’s Talk Shred, you’ll know that your personal details whether on paper documents or digital media storage are safely destroyed. Whether it’s one bag or hundreds of archive boxes of personal documents you no longer need, we can handle your shredding easily and quickly for you as a one-off or as a regular service. 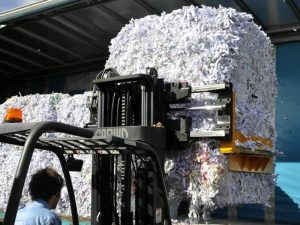 Find out more about our Paper Shredding services. We can deal with memory sticks, video tapes, floppy disks, CDs, DVDs and hard drives for you, safely destroying them so no personal information is retrievable. Find out more about our Digital Media Destruction services. All confidential material is destroyed at our secure premises in Dundee within 24 hours of receipt and the entire rigorous and safe process, from receipt of data to its destruction and recycling, is handled by our vetted staff. For more information or a shredding quote, call us on 01382 725162 or email us at sales@letstalkshred.co.uk or contact us online and we’ll call you back.